Thank you patients at Orthodontics at Don Mills for donating! 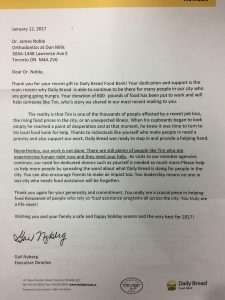 We received this heartfelt note today from the Daily bread food bank in thanks for the donation of 600 pounds of food for those in need over the holiday season. Congratulations to our wonderful patients. In our ongoing effort we are going to continue our campaign and Orthodontics at Don Mills will be a hub for donations of non-perishable foods throughout year for the Daily Bread Food bank. We will continue to have contests and rewards for our patients who donate. A heartfelt yhank you again for your contribution and for fighting hunger in Toronto, from all of us at Orthodontics at Don Mills.